How do we speak about the unspeakable? This is the foundational question of Being & Death. The search for an answer leads to the structure of this book: chains of analogy forming a circle around the unknown, gesturing toward the unspeakable through the negative space of allegory. This diagram, which is visually and structurally similar to the Void Mandala, describes this process of circling1 the unknown. The idea is relatively simple: you can’t talk about the unspeakable, but you can outline its shape through analogy. The shape of the unspeakable becomes more robust the more analogies there are in your chain. When you ask the question, “What does every link in this chain have in common? What does the chain encircle?” Your answer is there in the negative space, the common thread connecting each analogy. We talk about these concepts because they can be talked about. They exist in the realm of consciousness, in the realm of that-which-can-be-spoken. However, if we have enough of these analogies, we can form a metonymic chain that encircles the unknown. By understanding each element in the chain and understanding how their analogy works, we can come to understand the unspeakable space around which they circle. This is metapattern2. 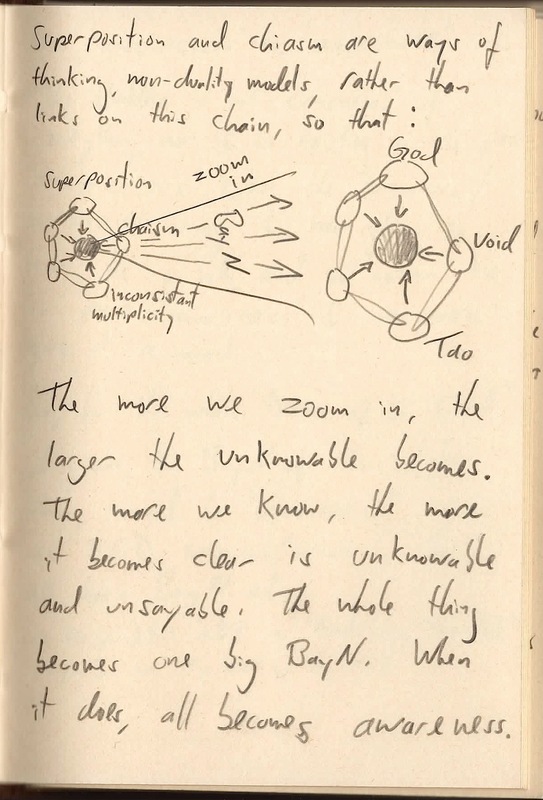 This page shows how one can continue to zoom into the analogical chain, expanding the unknown. The goal is never complete knowledge, but rather absolute expansion of the unknown. This harkens back to Socrates, who is attributed with saying, “I know that I know nothing.” Which, if our goal is the unknowable, then this “nothing” is indeed what we’re after. Thanks for the comment, Eric! You actually understand the concept far better than I was able to explain it in this post. When talking about the unknown, inside/outside binaries become highly problematic. I tried to talk about the problem with prepositions here and where to situate things, like the unknown, that are both outside and inside simultaneously (this is why I like the term “both and yet neither”). That being said, you’re spot on: from an emotional standpoint, being a human means encountering the unknown within us. You’re doubly spot-on when you bring up consciousness. Check out the conscious/unconscious interface diagram here for a more clear depiction of where the unknown resides for the human subject. Just as the unknown is the “unconscious” of each human, so is it the unknown of each system, like religions, as you mentioned. The unknown is not outside each religion, but at its very core. This is why each time we zoom in, the unknown continues to be at the center. That being said, prepositions don’t really work here. It’s like we’re trying to talk about three dimensions using two-dimensional language!